Traditional lubrication in the tribology field is concerned with lubrication between surfaces and reduction of friction; whereas, our research is aimed largely at understanding how porous and elastic surfaces interact with overlying particles separated by a thin layer of liquid. Circulating blood cells are an excellent example of the interaction between poroelastic surfaces and particles. Blood vessels have a surface layer called glycocalyx that can be understood as poroelastic. The interaction between the glycocalyx layer and particles (leukocytes, platelets and red blood cells) produce forces that maintains underlies vascular processes, such as margination. This biological feature is one of many naturally occurring instances of particle interaction with poroelastic surfaces. A strong understanding of the physics involved with these surface layers would allow the design and treatment of surfaces that could be actuated in a way to control and enhance particles motion above the surface. The questions we hope to address in this research are: how does the force on the overlying particle depend on the underlying microscopic features of the surface (elasticity, texture, etc.) ? Can we control the motion of particles by tailoring surface properties, and if so to what extent? These questions are being addressed through the use of both numerical simulations and analytical work, to describe the fluid-surface interaction of porous and poroeleastic surfaces. Some of the challenges inherent with this type of problem are the different length scales associated with the coupled domains. The surface is typically described with very small scales due to the intricate geometries; where as the fluid domain and particle might be better described by larger phenomena and length scales. 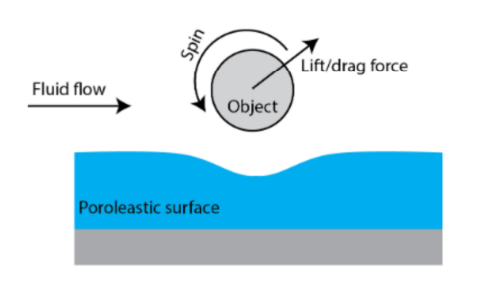 The basic problem currently being investigated is how modification of a poroelastic surface could influence a cylinder in close proximity to the surface as depicted in the figure below.